Jason's Arduino Si5351 Library (click on Download Zip) and install it directly into the new Arduino IDE as mentioned in my last post. Hardware Layout for this program can be found here. You can output frequencies up to 160Mhz. Keep this in mind when you use the 4X frequency option. You can also tune in 1Hz increments if you so desire. Also, I use clk0 for VFO output and clk2 for BFO. You can easily adjust the frequency correction using the Serial Monitor and the keyboard. Make note of the offset and put it into si5351.set_correction(); in the VFO sketch. The correction is no longer stored in the board EEPROM so do not comment out the set_correction line as I had mentioned in the past. Also when using the current hardware setup, nothing will change on the LCD while adjusting the frequency - only on a frequency counter. Looking at the above screen you will notice three Si5351 libraries in my "user libraries" folder. The Adafruit_Si5351 is not a problem since the header file uses a different name. The "Si5351" and "Si5351Arduino-Jason" share the same header file name. I did get an error that said something like "multiple libraries were found for si5351.h files - you must die". Both were Jason's newer library but the one, "Si5351Arduino-Jason" had all the newer upadates and examples so I deleted the "Si5351" folder. Hello Tom! I see you've implemented my request in Multi-Featured VFO code.Manny thanks! I changed something into (instead of 16x2 lcd, put 20 x4), etc.Just little things HI!! However, I do not know something, that's how with the frequency change LCD displays band. Example: When the VFO on 3.500.000Hz-3.800.000Hz, LCD shows: band "80m",on the 7.000.000Hz-7.200.000Hz shows: "40m" and so all HAM bands.In the case, when VFO is not in HAM band , lcd display: "OUT OF BAND"
Please do these changes implement in Multi-Featured VFO! That is one step more to the standalone RTX! I was just finishing SDR RTX planned UT3MK, so that the HW almost over. I have dozens of times looked at the video of NT7S, and what it can do, but that in his code just does not ?? P.S. I visit SQ9NJE site,put his sketch for Si5351 SDR ,but have bunch of error? Hello Tom thanks for putting the sketch together, works great! i added from Ashhar Fahrans Sweeperino sketch a DBm meter to your compilation. I could not get the sweeperino to work with an encoder, Still trying though! With your code and the 8307 meter working together i can play with filters now! one question? what should the output of the si5351 from clk0 read in dbm? Im trying to calibrate it and dont have a scope. Hi Tom! I know this is an older project, but wanted to let you know that I've adapted this code to work on several different HB rigs (on #4 now!). Thanks for sharing it with the community! Glad you could you could get something out the post. Thanks for your comment. I'm just reading the sketch and see the interrupt enabeling is different from the Arduino manual. The Arduino manual uses 'attachInterrup( interrupt#, ISR, CHANGE). The sketch as given compiles without problem for an UNO bus does not compile for an Arduino DUE or an Arduino M0 pro. Do you know an easy way to make de Arduino sketch to be compiled for the Arduino DUE or an Arduino M0 pro. If I want vfo - bfo output on one band and bfo -vfo output on other band, is it possible ? Cant seem to get around this error message. 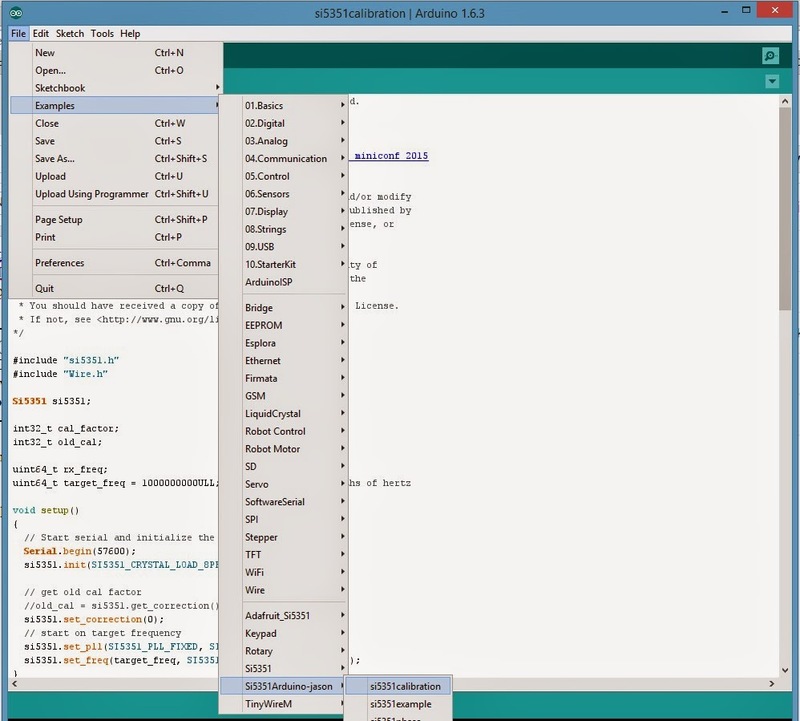 Arduino: 1.6.11 (Windows 10), Board: "Arduino Nano, ATmega328"
// 0 is the default crystal frequency of 25Mhz. Arduino: 1.6.5 (Mac OS X), Board: "Arduino/Genuino Uno"
You can see that an additional 0 is added (the third parameter) that is the correction factor of the crystal. The set_freq method has also changed and it removes the 2nd parameter requiring only the frequency and the clock. It is very simple to do a search on "set_freq" and just remove the middle parameter and its comma. i.e. You need to go to https://github.com/etherkit/Si5351Arduino and view the README. Thanks Tom, I have it compiling right now but ran into another problem . Direct conversion setting and X4 setting fails to compile. The error referenced long long and I remember reading something about that but have to look for it. fixed direct conversion. I was not completed. pleases check this to make sure it is correct. que bomestes projetos waldir muito obrigado amigo!!!! i have error like above... any suggestion for me? Can one use this sketch to simply set two clocks for use in a FT8 20m TX? I only need one for the LO and the other for the BFO. Adjusted for the IF frequency, of course. I don't need a rotary encoder of even a LCD display. Yes, you could just set the freq in setup and pretty much ignore everything else. Do you have a pc board layout for the vfo? If so, does it happen to have a lpf or bandpass filter to convert the SI5351 to a sine wave?